Excellent quality and easy to install. It comes with instructions but I did not need them. I took off the passenger seat and flipped out the luggage straps. The bag comes with all you need to fasten it on the bike. I filled it up wit some rags so it can set. I guess it depends on how far you go, but what do you take with you when going out for a little tour? I still take the 30 :-D.
The plan is to eventually get a 10. I needed the 30 for a 300 mile trip so it made sense then. 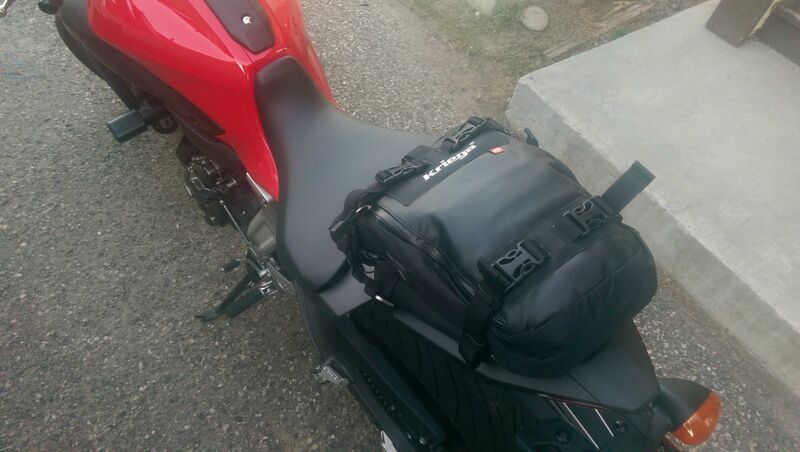 I used to take a bookbag but after getting the kriega, wearing a bag feels like a crime. lol, I meant, what do you put in your bag and take with you when you g on a little trip? A small toolkit with the essentials - allen wrench (with all sizes), screw driver, zip ties, and a couple of wrenches that match my bikes tire sizes. Always have a water bottle. Always have a sandwich of some kind. I like to eat. Extra shirt or my undershirt goes in the bag if it is too hot. And I sometimes Ill carry a pair of sneakers depending on the trip. Kriega makes some great packs and gear. I really like their stuff. Rode 45 minutes home in the rain one time on old bike and everything including laptop in my Kreiga was perfectly dry! Tired of wearing a backpack while commuting to work and on my day trips, ordered a kriega 10 last night. Sort of wanted a tank bag, but not much info out there on fit for our bikes with the plastic tank panels. You are going to like it. I know I do. It fits perfectly on the back seat, you don't even notice it. And you can pack a lot in it if you want. I ordered one last night too. They look like the best option all around from what I could see. Thanks guru for posting this thread. Yep, and I still might take it to a tank bag at some point, $35 to adapt this bag into a tank bag. Credit goes to Kipawa. He showed me the way. 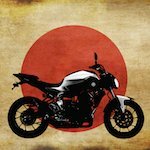 Forum all about sharing the good and bad we have all found over the years and with our new bikes, but thank you! As the old saying goes "credit goes where credit goes"
I got my us-10 in the other day and was pleased with the quality and design. Can't wait to get my bike back from the shop tomorrow and test her out!! Do you guys think in order to fit an EDC bag inside of the kriega, one would need to size up to the 20 or 30? Even after I park I've got a bit of a walk to get to my building for work. So I want to be able to fit my bag, plus rain gear and essential roadside tools, maybe a fresh shirt. Also, anyone that has one notice any way to make it lockable? Like 2 zippers you could run a lock through. I realize anyone with a pocket knife can get in but I want at least a little deterrence as my camera phone is prohibited at my job, so it'll be in there.